I wanted to give Southeast Asia another chance. I wanted it badly. 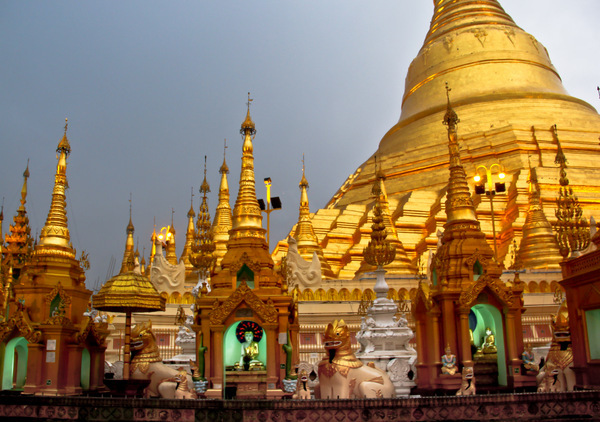 This is also why I chose to visit Myanmar. I thought that a country that was isolated for so many years, keeping much of its history and traditions, would gain my heart. But it didn’t happen. People in Myanmar are awesome, the kindest I’ve ever met and probably the kindest I’ll ever meet. They incessantly smile at you, say hello, are curious about strangers and they are keen to proudly show how they’re keeping up with their traditions and abilities. Despite their poverty, Burmese people have a dignity that can teach us many things we have forgotten about the essential values of life. I would like to get to know more about their lives, how it was during the dictatorship and how it is now. I’d like to ask about their expectations and dreams. But communication is not easy. Many of them speak a little english, but not enough – and with such a strong accent – to get longer conversations and discover more. I’m now in Bagan, the land of the thousands temples. It’s quiet and peaceful. I like the place, but… the truth is that my heart is not beating hard and I am unable to feel strong emotions. Once again, as it often happened during the last days, I wonder ‘what am I doing here’? And for the first time in years, I’m counting the days left, longing to go back home. How different I feel now from last winter in South Africa, where I tried any trick to extend my flight ticket to stay longer and had to give up only because it was too expensive. How bad I would have loved to stay longer! At the beginning, I was feeling a little guilty. So may people fall in love with Southeast Asia, what is wrong with me? Why am I unable to fully appreciate this area of the world? I kept thinking about it, and I’m eventually convinced that Southeast Asia is simply not my place. But why? I guess it’s a matter of culture and climate. I grew up in an area where we have continental climate and while I’m not fond of extreme heat or cold, I like seasons and I’m fascinated when looking at how nature changes. I like landscapes with contrasts, changing brilliant colors, different and unusual shapes. In Southeast Asia, I feel overwhelmed by the heat, already exhausted after a couple of hours and losing interest for everything surrounding me. And although the landscape in Myanmar is nice, I feel rather bored by its monotony, like it often happens to me in tropical countries. As for culture, like I said to someone – although I don’t remember who that was – many years ago, I’m afraid that I’m a descendant of the Ancient Greeks, strongly bound to ancient history and the amazing artistic and architectural remains scattering the Old World and the Mediterranean area, and profoundly latin. 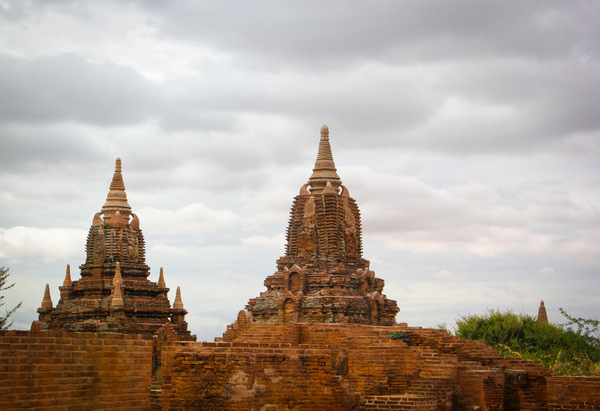 Apart from the stunning old temples in Bagan – unfortunately partly spoiled by the ubiquitous rubbish and newly built temples that are nothing more than a useless addition – not many buildings are more than a 100-150 years old. Even the universally acclaimed Shwedagon Pagoda in Yangon is so packed with Buddhas most likely stemming from mass-production and looking all the same – not to speak about the sparkling colorful lights at night making the place all the most kitsch – that it ended up being something nice to see but, to me, nothing more than that. I am not a religious person, so maybe this makes me unable to understand the real importance and get a sense of the pagodas. What’s strange, though, is that when I visit a gothic church in Europe I can feel the spirituality that lays behind and that drove to its construction. I couldn’t feel anything of that in the Burma pagodas. And I wonder, what am I missing and why? I guess there’s also another reason I’m not experiencing a burst of love. 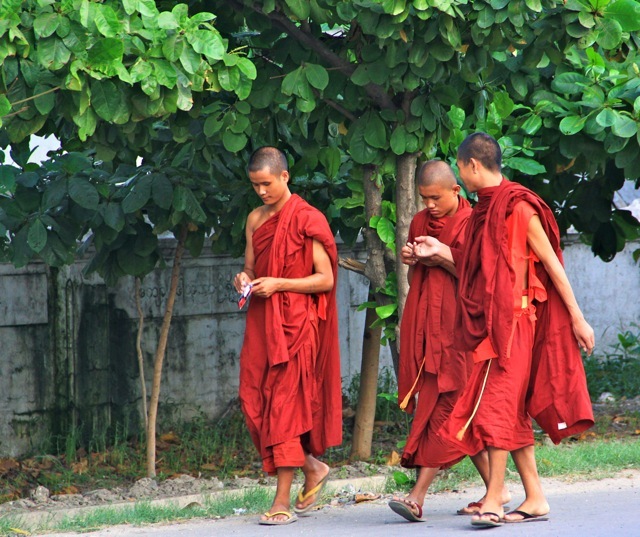 Myanmar is calm and peaceful, but it’s not joyful. Now that I think of it, I found that none of the countries of Southeast Asia I visited so far is transmitting me a sense of joy. It’s more a sense of monotony in the calmness, as if there were no real highs or lows, no strong feelings, for the best or the worse. In that I believe I am latin. I could cope with the heat in Cuba because of the music, the colors and the joy sparkling in people’s eyes. I still remember the never-ending astonishment in Peru, in front of an ever-changing scenario, from the sea to the sand dunes, from the jungle to the high mountains and the glaciers. And I didn’t care of the violence in Venezuela because the breathtaking landscape and the always laughing Venezuelan made me forget it all. I know it now for sure. Contrasts make me feel alive. Contrasts give me strong emotions. Only lands of contrasts strike my heart and enliven my perception. Did you ever happen to feel out-of-place, asking yourself ‘what am I doing here’? Where and why? I’d love to read your stories. There are some places in the world that just resonate with your soul. Canada can seem boring to some but I love the contrasts in the country and the change of seasons. I didn’t enjoy Tahiti one little bit despite many people raving about it -mostly because of the energy zapping heat but also because of sky high prices. I’ve loved every trip to South America and Europe and found most -but not all – of what I’ve seen in Africa to be enchanting. We are all so different and I love the honesty of this post. There has been a few places I’ve been to where I’ve suddenly realized that I really should just go somewhere else. But as countries, not so much. Although I didn’t really like India that much, but that just seems to be one of those countries that you either love or hate. Thanks for being so honest. I admit to feeling something of what you’ve described about Australia. Sometimes I feel guilty of thinking “but there are no stunning landscapes and the culture is uninspiring” when the tourists just rave about it. In almost 7 years of non-stop travel on 5 continents, 44 countries, I must admit, I often have felt out-of-place. I think weather does have an impact on how one experiences a place..too hot, too cold, rainy, dark,gloomy etc…especially day after day..DOES color one’s perception. Things like crowds, uncleanliness, comfort zones, bugs, dogs, unfriendliness,prices,people etc impact too. I think we all have travel preferences ..I relate much more to Europe than Asia as well. Of course one is first world and one is third world, so that impacts. But, I think one’s view of the world, no matter where you are, is really about inner attitude. Every place has things to like,( and not like) so it’s what we focus on. Expectations play a part in travel perceptions too. There are plenty of places that people rave about that I was disappointed with upon first seeing. Barcelona comes to mind. My expectations were very high, so I felt let down. Yet, now that I’ve been there over 16 times ( often for months at a time), know it well and have local dear friends there …it’s become one of my favorite places. Time can make a big difference in perception. Seeing a place for a day or week is much different than spending months there. We are now on our second long stay in Asia ( so my young child can immerse in her Mandarin..as she did with her Spanish in Spain) and I like it better, the longer I stay. In our 2 visits of 6 months each, we have never even used or needed air conditioning in Penang, the buses and most buildings are air conditioned and we do most outside things early in the morning or late in the day like locals. We’re on a high floor with spectacular sea views,so get lovely breezes constantly and I love the light. So there are always ways around heat. I’m very heat and cold sensitive, so I worried needlessly from others warnings, but find it quite pleasant. Even southern Spain and California Med winters are too cold for me now. I am totally spoiled by tropical winters. There are also many truly ancient historical and moving sights in Asia….Potala Palace,Angkor Wat,Chion-in Temple, Tiger’s Nest and Prambanan come to mind. You can also find a huge variety of landscapes here too…Malaysia alone has magnificent mountains, dense jungles, river systems, sandy beaches, fertile plains,forests etc. Do visit Bhutan …the last Himalayan Shangra-la..one of our favorite countries in Asia and one of the most unique in the whole world. In May the weather is cool and Med like and the mountain landscapes are stunning and pristine. It will take your breath away! I think it is just fine to not love every place equally, but I think perceptions can change with time and repeat visits or longer stays or who you travel or stay with. I hated Paris my first visit long ago in my twenties ( partly because I didn’t speak the language) and hurried back to London which better fit my comfort zone. Now, at 60, I have been so many times I have lost count and love it more each time ( despite still not knowing much French). This is the “Asian century” they say, so I wouldn’t give up on it just yet. 😉 Perhaps you just haven’t found your sweet spot here yet. Like Europe..Asia is big with endless choices. We’re all different, and I don’t think you should ever feel guilty for not liking a place you visit, or liking it, but maybe not being wowed. Right now I’m in Prague, and loving it. I want to stay, but changing my ticket will cost me an arm an and a leg. Prague has a vibe that I love. I also visited Budapest, and can’t wait to go back. Why? These places just make me feel good. I don’t apologize for not liking China. The world is a big place. I don’t have to go back there unless I choose to. What a thoughtful and brave post Simon. Like you said, it’s rare to see anyone who doesn’t fall in love with SE Asia, but it is refreshing to see another side to it. This is how I felt in Asia too! I didn’t really understand why I couldn’t throw myself into it and love it when everyone around me did – I just knew that little things upset/annoyed me more than they should and that I was desperately counting the days until my return flight. I’ve never felt like that travelling before so I was utterly unprepared for that feeling. I am always so thankful when people write honest entries like this; not everyone is going to fall head over heels for every place, no matter how much we love to travel. There seems to be a taboo around saying you didn’t really love a place and you’re not sure why, but the simple truth is that we are naturally drawn to some places and perhaps not so much to others. Not enough travel bloggers are honest about this. Thank you for writing! Definitely highlights how are all very different. And it can be hard when other people rave about an area, and when we find ourselves there all we can do is shrug and think Were they serious? Thanks for being so open about your experience. I know what you mean. We don’t have to ‘like’ every place we go. There’s a place that pull your heart closer, and there’s a place that just give you a flat emotion. I had a lot of moments in China and some of the places in the US. I’m pretty good at making things good, but it’s different if the places are meant to be or not. There are places that make you constantly talk about even though you were there for only few days, but there are places that just dismisses from the memory. Really enjoyed reading this bit of “Travel reality”. Personally I feel it’s perfectly fine not to like a place or even region just because “everyone” else does. Like you, I too don’t like the SEA heat. In actual fact for me it’s the humidity and heat mix. I survived it long enough to know it’s not for me. I’ve often written about not liking Thailand. It’s nothing to do with the Thai people, culture or any one large thing. It’s a mix of things. From the food (I really don’t like it), to the heat, pollution, over-tourism and the list goes on. We simply don’t click. I don’t see anything wrong with it at all. I think that’s what makes travel, and people so great. It’s the diversity. What’s one person’s ideal destination is another’s nightmare. And another persons nightmare is someone elses dream location.